CHICAGO – Good news, “Twilight” junkies. The two-disc DVD of your favorite movie, the vampire romance starring Kristen Stewart, Robert Pattinson, Taylor Lautner, Ashley Greene, Billy Burke, Peter Facinelli, Edi Gathegi, Cam Gigandet, and more really delivers. With excellent video and audio and hours of special features, “Twilight” fans will have only one way to spend their weekend. As for the movie itself, I won’t dwell on it because you know by now if you are a part of the “Twilight” army. Those of you anxiously awaiting every piece of news about “The Twilight Saga’s New Moon,” now filming in Vancouver, and devouring details about “The Twilight Saga’s Eclipse” already know the pros and cons of Catherine Hardwicke’s first film based on the Stephenie Meyer blockbuster series, the film that put Summit Entertainment on the map. 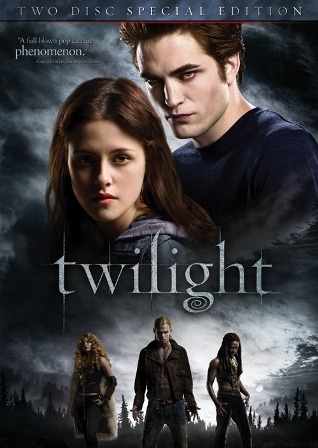 Twilight will be released on DVD on March 21st, 2009. Now, there may be a few of you out there like me, people unfamiliar with the books and who hadn’t seen the film before DVD. After months of hype, I kind of assumed that “Twilight” would be your standard crowd-pleasing fare or maybe something even worse based on the critical response of a few of my friends. Having seen it for the first time on DVD, I can clearly see both sides of the “Twilight” phenomenon - the rabid fan base and the people ready to tear it down. The dialogue is particularly weak, there’s a spark missing between the leads that would have enhanced the film, and the special effects/action scenes are really quite awful. Even if you’re a big fan of the books, they could have done better with the movie. But all of these are things that could be fixed with a new director on the sequel and Pattinson and Stewart do have their own charms and talents (even if their chemistry needs some work). What’s easy to see after watching “Twilight” is why this has become such a massive hit both on the page and on the big screen. It’s a romance as old as time - the boy from the wrong side of the tracks. This one just happens to be a vampire. It’s Prince Charming for the age of My Chemical Romance. Before we move on to the DVD details, I urge all of you who even remotely like “Twilight” to check out “Let the Right One In”. It rules. Enough about the movie. You want to know about the DVD. Summit is relatively new to the big dance with “Twilight” being their first major hit, so how did they treat the girl that brought them to the party? Pretty damn well. Fans will probably watch the movie again first and notice that the video and audio are above par. Watched upconverted on a Blu-Ray player, I noticed very few problems with the video and the audio in Dolby Digital 5.1 is very good, especially for standard DVD. But what about the special features? Hardwick, Stewart, and Pattinson stepped into an audio recording booth to “Take you through how we did Twilight.” The three are clearly friendly, which makes for a lot of laughs and in-jokes but not a great commentary. They don’t really offer a lot of information beyond how cold it was on a certain day or whether or not the shirt Rob’s wearing in that scene is really his own. And Pattinson and Stewart are both a little shy about their characters and craft. At one point, Rob even mentions all the things he could say that he doesn’t want recorded. Thanks dude. But fans won’t care. They’ll just want to hear Stewart and Pattinson one last time and it is intriguing to hear how well the three get along and how much Hardwicke clearly loved working on the project considering her controversial departure from “New Moon”. Stephenie Meyer talks about the use of the great band Muse during the baseball fight scene and then Catherine Hardwicke introduces the band performing it live. Muse rules. Check them out if you’re not already a fan. Hardwicke introduces the video by mentioning how much the lead singer of Paramore pushed to be involved with the movie because she’s such a fan of the books. She was allowed to come and see some scenes before writing “Decode,” which plays over the end credits. The video features Paramore in the woods with clips from the movie. No introduction this time. Just a clip of Linkin Park playing their song live from their own concert DVD. Overall, nothing remarkable here that should have been kept in an already too long movie. It’s all dialogue and character that was correctly trimmed. Bella’s first day at school at the diner with her dad trying to find more information about the Cullens. More of “the bad vampires” attacking Waylon. The special effects are still ridiculously bad in this scene. A little bit longer in the meadow with Edward and Bella. More details in Edward’s bedroom when Bella first comes to the Cullen’s house. Way too long. Well cut. More between Edward and Bella before they head off to the baseball game. Once again, nothing remarkable. All moments cut correctly for pacing. The Cullens give Edward their opinion about his new fascination with Bella. Nothing here but “Edward, she’s not one of us.” Read poorly too. From the first time that Bella dreams of Edward and “a few other crazy ideas that Catherine had right on the spot”. Some of Catherine’s favorite lines from the book and Kristen’s “favorite scene” and it didn’t make the movie. Fans will probably be most drawn to this scene of dialogue between Bella and Edward. More of Dr. Cullen and Esme after Edward and Bella leave the house to go on their tree-hopping journey. Some more action with the bad vampires during the chase. This is the big draw on the DVD set, the full background on the book and the movie with interviews with every player from Stephenie Meyer through the cast of the film. It’s actually a very well-made featurette with behind-the-scenes material that should be a big crowd-pleaser for the fans of the film. Apparently, maybe you heard, things went CRAZY at Comic-Con last year. Revisit the madness on DVD. The original sneak peek, comic-con sneak peek, teaser trailer #1, teaser trailer #2, and final trailer. ‘Twilight’ is released by Summit Home Video and stars Kristen Stewart, Robert Pattinson, Billy Burke, Ashley Green, Taylor Lautner, Peter Facinelli, Edi Gathegi, and Cam Gigandet. It was written by Melissa Rosenberg based on the book by Stephenie Meyer and directed by Catherine Hardwicke. It will be released on March 21st, 2009. It is rated PG-13. Submitted by Anonymous (not verified) on July 8, 2009 - 3:05am. Submitted by Anonymous (not verified) on September 13, 2011 - 4:08am.